Some good news out of Washington DC: the Federal Transit Administration has approved $100 million in New Starts funding for the third section of the Purple Line Extension between Century City and the Westwood/VA Hospital. Long story short: Metro received significant New Starts funding for the first two sections of the Purple Line project ($1.25 billion for section one and $1.187 billion for section two). The New Starts money is supplementing dollars from the Measure R and M sales taxes. Metro has also applied for $1.3 billion in New Starts money for the third section. 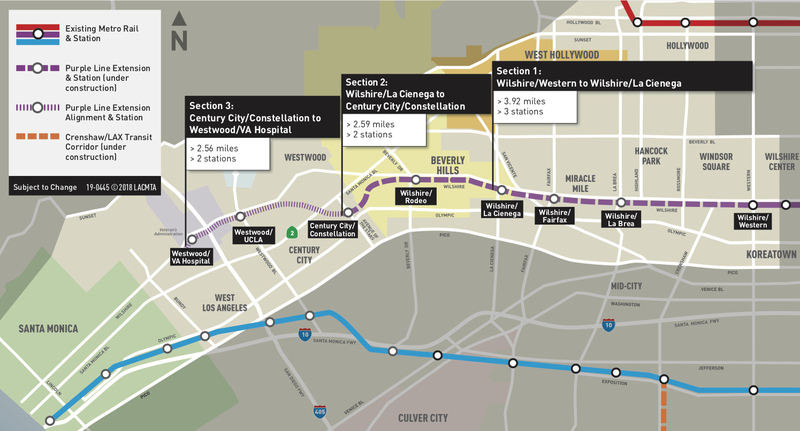 The $100 million is seen as a good indicator that the FTA will enter into a larger funding agreement for the third section, which is needed to complete the Purple Line to Westwood by 2026. Attentive Source readers know that transit funding doesn’t grow on trees on the national level and there is only so much federal funding to go around. So this seems to be a pretty positive step for a project that will serve the Westside, the second-largest job center in L.A. County. Section one and section two are both under construction and tunneling began last month on section one — see below. Here’s a good article in the L.A. Times. And here’s the Purple Line Extension’s home page on metro.net. The last segment seems so puny. Westwood should have 2 stops. The last stop at the VA Hospital is useless for most people. They should have a final stop further into Santa Monica or join into the other Metro Rail line. Oh well, and better than nothing, heh. I agree TimW. The more people the system serves the better. I do wonder, however, if the EIR found that this particular section had low ridership potential. The area IS upscale, and this is also where Beverly Hills High School campus is located. There was plentiful public comment opportunities for this project. Absolutely right, TimW! On page 73 of this 1968 report, it states the final stop is on Wilshire between Federal & Barrington. This isn’t building for the future or even for right now, this just gets us caught up to 50 years ago (60 years when it’s actually built). $100M is a drop in the bucket compared to the total cost of the third segment but I’m glad to see it. I remember last year we were wondering whether we’d get anything at all so i’m happy to see federal aid. I have a question about the state gas tax I hope you guys are able to answer. Will we have the opportunity to apply for project funds every year, and would it possible for a single project to get multiple awards over time? What I have in mind is the Van Nuys corridor and the boards recent decision to build the rail line above ground due to lack of funds. If other funds become available, it would be nice to see, at the least, build the busiest intersections under ground possibly using the cut and cover method which proven a bit less costly. Thank you for your work guys! I personally really appreciate your stories. To me, the line will never be complete until it reaches the sea, or at the very least, the Third Street Promenade in Santa Monica. There needs to be rail connections between Santa Monica and Westwood (UCLA), between Santa Monica and Beverly Hills, and between Santa Monica and “The Miracle Mile” which the Expo Line does not provide with the more southerly route it carves. NO ONE is going to want get off the Purple Line in Westwood and take a bus to the Expo Line, just to continue their journey into Santa Monica. So they will continue using their cars to get into Santa Monica from those places, and continue clogging Wilshire Blvd with cars. The line MUST be continued into Santa Monica. If it never makes it past the VA Hospital, it will never seem complete. Agree that the VA Hospital is not a logical terminus. According to Metro, at the time, that’s all the budget could allow to get the line (just barely) past the 405. One of the Sepulveda Pass proposals has the Purple Line being extended in phases to Bundy/Expo (with an added stop between the VA Hospital). The final phase would be an extension to LAX. This is the logical terminus for the “spine” route of the transit system.